Duluth East coach Mike Randolph has been behind the bench long enough to know what little tweaks need to be made in a game to shift the tempo and outcome. He’s also coached his fair-share of talented teams, often resulting in many different styles of play being thrown at the Greyhounds game-by-game, period-by-period and shift-by-shift. Against 7AA rival Cloquet/Esko/Carlton on Monday, Feb. 6, Randolph believes his Hounds saw a opposing style they’ll have to get used to in the playoffs. For the first two periods against Cloquet, the Hounds witnessed the Jacks transition from an open style of play to a defensive lockdown. Duluth East controlled the puck in the offensive zone for extended periods of time, but didn’t properly adjust until the second intermission. Once the Hounds started sending a guy to the net, good things happened quickly. Meirs Moore scored early in the third to break a 2-2 deadlock before Alex Toscano and Conner Valesano netted goals to put the game away. The common component to the three goals in the final stanza was a body in front of Cloquet goalie John Scheuer. Toscano’s goal was a perfect example of the adjustment paying off. With the Cloquet defenders sinking towards the slot to keep the puck to the outside, Toscano wheeled around the circle, cut to the middle and fired a wrister through sticks, legs and bodies and into the net. As far as Randolph is concerned, Monday’s game was a great experience for his team. 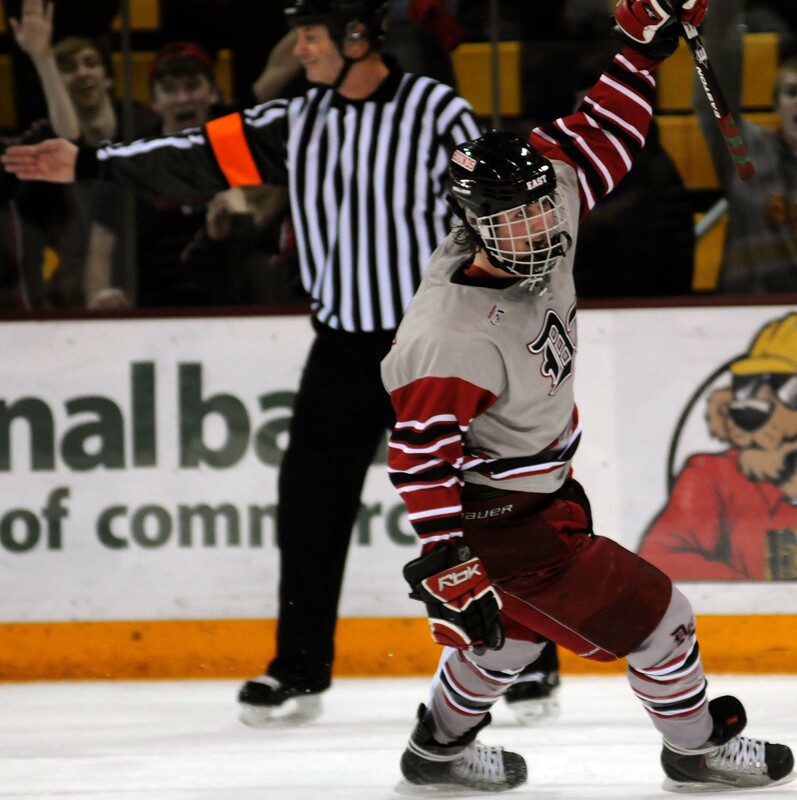 Duluth East's Alex Toscano celebrates his third period goal. 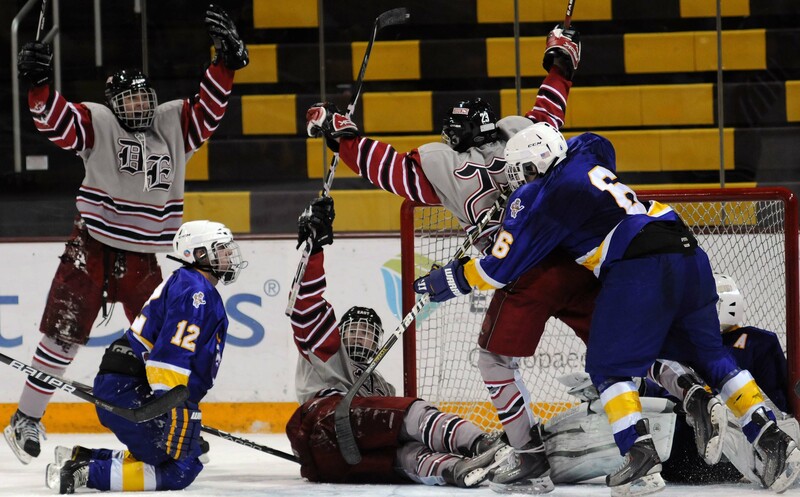 Third-period goals by Meirs Moore, Alex Toscano and Conner Valesano helped top-ranked Duluth East get past a pesky Cloquet/Esko/Carlton team in a 5-2 win on Monday, Feb. 6, in the second game of the Perkins Fenzy at Amsoil Arena in Duluth. The Greyhounds and Lumberjacks looked to be set to add another classic finish to this storied rivalry after playing to a 2-2 tie through 34 minutes. Valesano opened the scoring 10 minutes, 7 seconds into the game when he knocked a Trevor Olson pass past Cloquet goalie John Scheuer to finish a beautiful 2-on-0. The lead didn’t last long, though, as Karson Kuhlman was able to tie the game just 50 seconds later on a shot from a tight angle. Then, with just 58.5 seconds to go in the opening period, Olson used a quick stick at the top of the crease to beat Scheuer and send the Hounds into the intermission with a 2-1 lead. Even so, the Jacks weren’t going away easily. Westin Michaud scored just 16 seconds into the middle period off a feed from his brother, Beau, to knot the score at 2. That’s where it stayed until Moore netted a goal through traffic to put Duluth East in front for good. Olson and Valesano each finished with three points, while Toscano and Phil Beaulieu had two-point nights. Jack Forbort and Nate Repensky had single assists for the Hounds, and Dylan Parker turned away 10 shots for the win. Scheuer, who has been rock-solid in net this year, continued that trend with 30 saves in the losing effort. Duluth East (21-1-0) will square off with fellow ISD 709 member, Duluth Denfeld, on Wednesday night. Cloquet (16-8-0) will wrap up its regular season schedule with a trip to Stillwater on Saturday night. The gritty center was the best player on the ice on Monday night, scoring twice and adding an assist in the win over Cloquet. With the Lumberjacks sitting back and cutting off the slot, Valesano showed poise with the puck, won tons of battles along the walls and helped the Hounds eventually break through the Cloquet wall. Much like his linemate Valesano, Olson was a huge factor in the Hounds’ win on Monday night. He set Valesano up for the game’s opening goal, and then put a puck into the top shelf from the top of the crease later in the first period. Olson’s size and ability to slow the game down was a lethal combo on Monday. Toscano used his size to make things tough for Cloquet defenders, his hockey sense to find the soft spots in the zone and his wicked wrist shot to score a big goal for Duluth East in the third period. Toscano also had an assist on Monday night, giving the second line for the Hounds eight total points for the game.